We had a little customer appreciation thingy at the Hard Rock Hotel for our lovely customers. In addition to drinks, of course, we had a little bit of food action too. 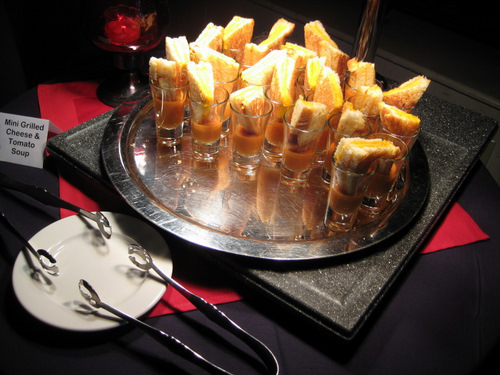 One of the favorite items of the evening, grilled cheese shooters! Look how adorable these things are! It’s a little shot glass with tomato soup and a piece of grilled cheese shoved inside. Cute and freakin tasty! They also had these vegetarian spring rolls with plum dressing. Now I typically love me some spring rolls / egg rolls with shrimp or chicken or what not in them, but these little veggie ones were great! The plum sauce was perfect, but it was extremely sticky! It was kind of hard to get it off the spoon and onto your plate. They also had these little mini beef wellingtons with cumberland sauce. I don’t know what beef welling is so I looked it up. I don’t know if these mini ones had pate in them. I also don’t know what cumberland sauce is so I looked it up too. I don’t think this one was fruit based. However genuine or non-genuine these were, all I know is that I liked them. 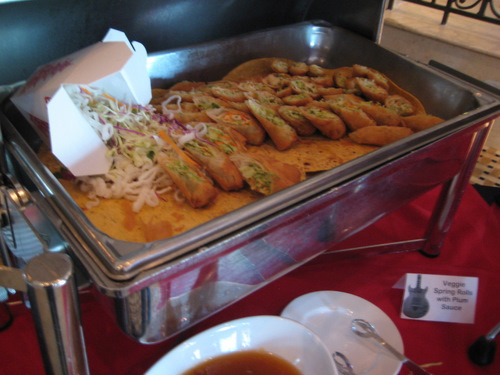 They also had some people walking around with other appetizers. 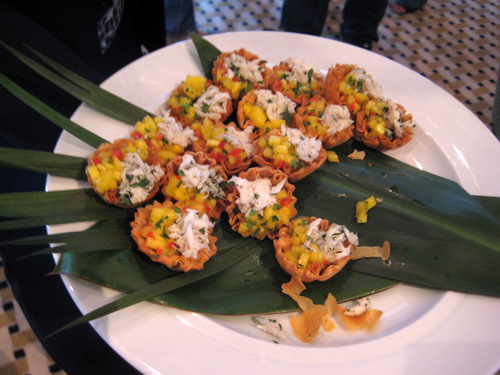 One of them were these adorable little mini puff pastries filled with crab and mango salsa. Delicious! 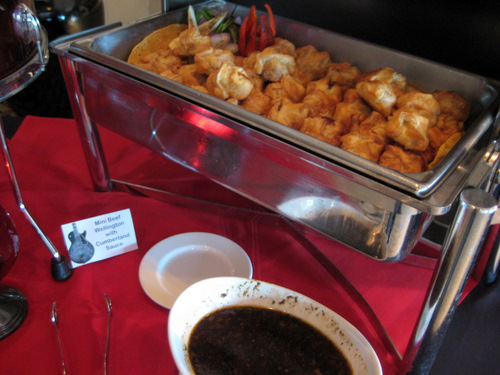 For a little hotel catered evening, the food was great!